MU meets you here in Macao! Manchester United arrived Macao at the Macao International Airport yesterday (July 21). Together with their CEO David Gill and team Manager Sir Alex Ferguson, the superstar team including famous players C. RONALDO, W. ROONEY and new comer NANI ALMEIDA, is ready for their third match of the Asian Tour versus Shenzhen Xiangxue Eisiti in the Macao Stadium at 8:00p.m. on July 23. The joint organizers represented by Chairman of Organizing Committee of the Venetian Macao Cup and also Chairman of MAIGOC Manuel Silvério and members of MAIGOC, as well as Chairman of Kaki Sports Yung Tsz Shuen, extended their warm welcome to the Manchester United team at the airport. Awaiting along their arrival path were also passionate welcomes from over 100 fanatical supporters of the Old Trafford team, which were all rewarded with the glittering smiles of the players. To provide the teams an opportunity to greet the media, a press conference was held at The Venetian Macao Resort Hotel which is schedule to opened this coming August, and the Official Headquarters Hotel of this coming October 2nd Asian Indoor Games. The MU open training session in the Macao Stadium will be held at 9:30 this morning (July 22). Last week all the 8,000 admission passes were distributed in a few hours, while earlier in June the 10,000 match tickets were sold out within 5 hours. Manuel Silvério who has also assumed the post as President of the Association of the Portugues Speaking Olympic Committees (ACOLOP) dedicated special wishes of success to the Portuguese speaking members of the team: players Cristiano Ronaldo and Nani Almeida and assistant manager, Carlos Queiróz. 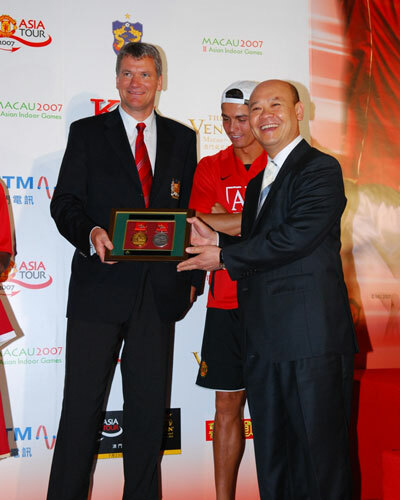 “Allow me to use Portuguese in welcoming the Manchester United team to Macau, especially the 3 Portuguese members, and express how joyful and privileged we are, as part of the Lusofonia (Portuguese-Speaking) community in Macau, to be able to share with them wonderful memories of the events in the next few days” he said. Speaking to the media Manuel Silvério highlighted the contribution of the Portuguese speaking players’ to sports emphasizing their success around the world.